As the sun seems to have escaped us once again, out comes the fluffy winter Pyjamas and Disney Minnie mouse slippers, (don’t judge you are never too old to be a Princess!) and a good old book with a nice cup of hot chocolate. If your looking for a new book I highly recommend ‘Prayers for the Stolen’. I heard about this book through my daily Emerald Street email and even pre-ordered it. It is only now that I have finally got around to reading it and wish I had read it sooner. With one of the first sentences being “The best thing you can be in Mexico is an ugly girl”, I knew this book was going to be interesting and true to the title it did not disappoint. 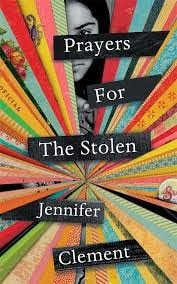 Mrs J Recommends ‘Prayers For the Stolen’ by Jennifer Clement. Every year in Mexico women go missing, stolen by drug cartels to be used as prostitutes or slave labour. This book covers difficult issues through the character Lady Di, named after Princess Diana. The story is set in a village in Guerrero in Mexico where lady Di lives in a world where girls fear being kidnapped. The women spend time digging holes for their daughters to hide in and make them look undesirable. Lady Di and her mother live in a community where all the men have left to find work in the United States leaving the women and children to strive for survival and fight their fate. Without giving any more away, have a read of Prayers for the Stolen and let me know what you think. Lady Di is definitely a character that makes you think and be grateful for the community that we live in.